“Spirit Horses Lodge” ©2013 Janice Tanton. Oil on belgian linen. 40″x72″ Purchased by Cenovus Energy Inc. Earlier this year, I was invited along with 36 artists in Alberta and Saskatchewan to participate in the inaugural “Cenovus Art Competition“. The focus of the competition was to identify “under-recognized artists” in Alberta and Saskatchewan, in the form of a competition. Normally, I don’t go in for these sort of things, but I liked what the company was proposing to do. For too long, many of us “older” artists have tired to see big art competitions such as the Sobey Award and the RBC Art Competition in Canada focus on the “young”…the “up and coming”. If you’re under 40 or a recent grad – there’s big bucks in art competitions in Canada. Kind of makes this senior feel like dog food at times, to tell the truth. I’m thankful Cenovus looked at meritous working artists. And I’m super excited that local colleagues David Foxcroft and Michael Cameron were recognized as “honourable mentions”! It was nice to be recognized for not being recognized, and then recognized. Ha. Odd…but true. Some of my strongest pieces were too large for the specs in the competition, so the difficult task I had was to find something I felt worthy of my current practice, beliefs and thoughts as an artist. 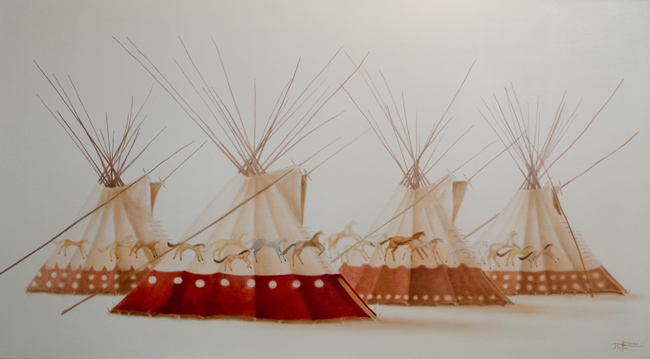 Coming off the CAMP exhibition (my first ever solo public exhibition) at Okotoks Art Gallery, I chose “Spirit Horse Lodges” for my entry into the competition. No artist worth their salt can engage in deep research and subject matter from a distance. They must be immersed, involved and see themselves as part of the work, the place and the spirit. My practice focuses with all of my soul, my heart and my emotion, on cross-cultural relationships and “the space between” . With an eye to the objective – the representational, but with a paintbrush filled with movement, spiritual guidance and immersion, I created “Spirit Horse Lodges” which describes the three aspects of our Human existance – the real, (the touchable), the spiritual and most importantly the Supernatural – the space in between. As a tipi holder, having spent many starlit and stormy nights in Siksika under the cover of the tipi canvas, the tipi comes to represent our house, our body, the natural and the spirit world. The stories and songs interwoven with the experience of being in and of the tipi are sacred. They come alive when spoken and told in front of the fire, with an energy that draws us all together and creates meaning in our lives. I hear from the company, that a great deal of discussion took place around my work. This pleases me immensely, as at the core of what I do and why I paint is to question….to create dialogue and span those spaces “in-between”. While my piece did not win the glory and the much-coveted publicity of the award, there was some sweet victory for me in knowing that the discussions around the topic of the work were had, AND….Cenovus went wayyyy beyond the competition and purchased the work for their corporate collection. This is testimony enough for me that the right pieces end up in the right places. I’m excited! Not only that, it helps to support our family through some very difficult times – spiritually and financially. May you always take a step outside your comfort zone to explore new territory. Oh…and the jury for this new competion? Have an eyebrow-raising look. Impressive! Grace Quote of The Day – On Naming It! CONGRATULATIONS Janice for having this AWESOME artwork bought. WAHOO for pushing past the doubts & entering.